US Chess Championships Begin Today! Grab your laptop, tablet, and your favorite chess app, program, or board and get ready to follow the exciting showdown in Saint Louis: the 2017 US Chess Championships! 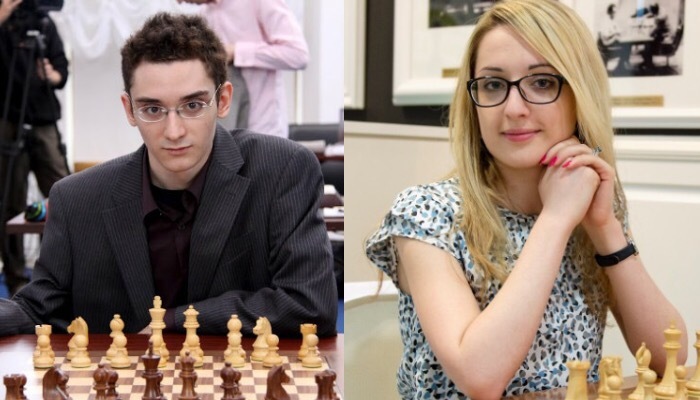 Reigning Champions GM Fabiano Caruana and Nazi Paikidze-Barnes will be fighting to retain their titles against the best that the country has to offer on the board. All games are played at 1300 CDT (GMT -5) and will be broadcast on Chess24, ChessBomb, and ChessBase. Also, I recommend trying out the Watch Chess app available on iPhone, iPad, and Apple Watch. I wrote a review about it awhile back and it has been a great companion for watching chess when stuck in a meeting or in another place where its not practical to bring up a browser-based website. Read more on the official website and follow all of the late breaking information on the US Chess Federation website. It is hard to find supporters for FIDE‘s Dear Leader Kirsan Ilyumzhinov outside of Vladimir Putin’s inner circle and those loyal to the oppressive regimes of Iran and Syria. Yet, the man manages to get re-elected to the post every cycle since 1995! Several attempts to oust him including a poorly run campaign by former World Champion Garry Kasparov have failed. The FIDE website and some chess news outlets reported yesterday that Kirsan had resigned as FIDE President following a special board meeting in Athens, Greece. Before cities around the world started the fireworks show, Kirsan himself released a statement via the Russian Chess Federation stating that he had not resigned from FIDE. Moreover, he claimed that the announcement was made because he is the victim of a plot by the United States to overthrow him. 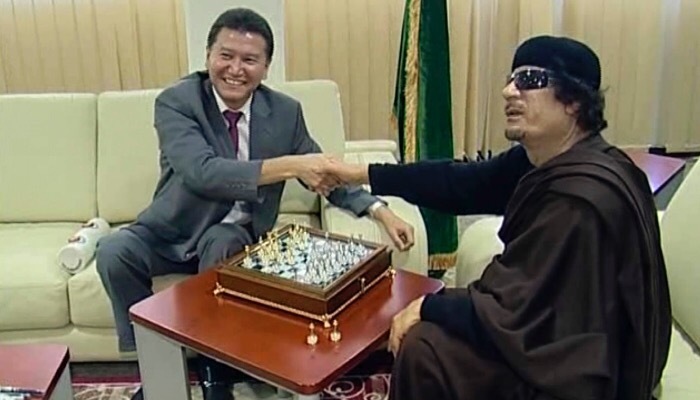 Kirsan’s dealings with dictators like Muammar Gaddafi (pictured above) has damaged chess’ international reputation and set back FIDE’s efforts to have chess recognized by the Olympic Committee. He was sanctioned by the U.S. Government in November 2015 for providing support to the Syrian government and stepped down temporarily until he could clear up the sanctions. 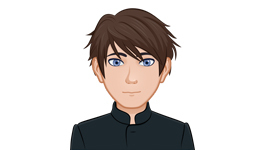 However, he has remained a key figure in some of FIDE’s biggest events, which has led to some confusion in the professional chess community. Kirsan continues to assert that he has not resigned, but things seem to be more unclear now than ever before. According to the FIDE website through official statement, AGON (evil), and the professional chess community outside of the Russian Federation, Kirsan has been officially removed because he stated in the 26-Mar-2017 meeting that he had resigned. ChessBase – Did Ilyumzhinov Resign? Apparently Not! 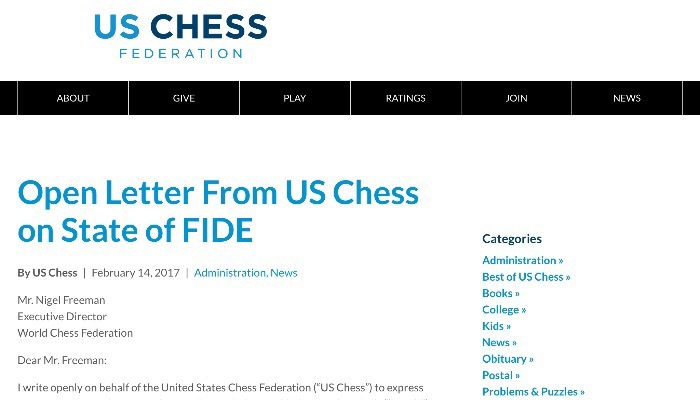 Earlier this week, the United States Chess Federation (US Chess) released an open letter from Gary Walters, the federation’s president. In the letter, which is addressed to Nigel Freeman of the World Chess Federation (FIDE), US Chess made official many of the concerns that the larger chess community has expressed for some time about the state of FIDE and the effect that Kirsan Ilyumzhinov’s seemingly endless tenure as FIDE president has had on the sport. The letter is very telling in that it shows the depths of leadership, communication, and organization problems that exist within FIDE; they are much worse than some had expected. Gary’s letter addresses the hijab controversy at the 2017 Women’s World Chess Championship in Tehran (still ongoing) and problems surrounding Ilyumzhinov’s sanctions by the United States Government and the contradictions between FIDE’s statement that he would step down temporarily to address the sanctions. Instead, Ilyumzhinov has appeared regularly at major chess events in the capacity of FIDE president and has made no apparent effort to clear his name with the Department of the Treasury. This is all stuff that we know, but perhaps the most interesting moment comes when Gary addresses the 2016 World Chess Championship in New York City. …this indecorous behavior is coupled with the conduct of a World Championship on U.S. soil without so much as a word in advance to the nominal “host” Federation, FIDE’s conduct becomes insulting. Gary’s right in that this kind of behavior is insulting to US Chess and to chess in general, but I am inclined to believe that US Chess did not receive a phone call prior to the announcement because Ilyumzhinov made the decision on the fly and that the intention to host the event in the United States was a last minute gamble to generate publicity. In addition to the Championship problem, Gary also addresses every chess fan’s least favorite shadow company: AGON. on several occasions AGON has failed to live up to its end of agreements with FIDE, with a predictable injurious effect on FIDE. The failure of AGON to make contractual payments has caused difficulties for some federations that would normally receive support from FIDE. President Vega states that he has informed FIDE in strong terms that it should cancel the agreement with AGON in light of its nonperformance. Oh. My. God! Yes! Please, cancel this contract…but it will never happen unless Ilyumzhinov himself is relieved of his position because AGON is another one of his pet projects. AGON’s failure to follow through on its contractual obligations is hilariously hypocritical considering its incessant attempts to sue legitimate companies like Chess24 and Chessbomb for sharing moves during the Candidate Tournament and 2016 World Chess Championship. Unit the dirt is cleaned from the FIDE leadership ranks, this will continue to happen only to the detriment of chess around the world. The motto of FIDE is Gens Una Sumus, which means We Are One People. As lovers of chess, we are one people but FIDE continues to act as though it is above the law and above the players and fans within its charge. Although I doubt that much will come of it, I am proud of my chess federation for speaking out against the destruction that FIDE is bringing to the sport. It is refreshing to know that US Chess remains committed to the truth of American ideals, which is obedience to law and standing up for what is right. I applaud Gary for his letter and for the board of US Chess for showing that they stand with the larger chess community as a body committed to fixing problems and promoting our game! Here is the letter in its entirety. Plus, you can read the original post on the US Chess website here. I write openly on behalf of the United States Chess Federation (“US Chess”) to express growing concerns that our Federation has with the World Chess Federation’s (“FIDE’s”) general casualness toward its own rules and statements, to FIDE’s lack of responsiveness to us as a member nation, to the questionable status of its president, and as well as to its economic health. On October 6, 2016, I wrote to FIDE, care of yourself, to ask that any religious requirements for the Women’s World Championship in Iran be spelled out plainly respecting the obligatory wearing of hijabs, as well as for any other religious conduct requirements that might be imposed upon the participants. Without repeating my earlier letter, the text of the provisions at issue may be found in Section 1.2 of the FIDE Handbook, as well as set forth in Principle 6 of the Olympic Charter. At the time of my earlier letter, we found it peculiar that FIDE held itself to the world as being opposed to discriminatory treatment and as a guardian of equal rights, only to award the Women’s World Championship to a country that resides at the center of controversy concerning the fair and equal treatment of women. We continue to find FIDE’s actions peculiar. I never heard from you on the above matter except in the briefest email by which you told me that my questions would be answered after FIDE conferred with the Iranian Chess Federation. That was months ago. Later, and without any of the promised answers being provided, you invited me to search out Mr. Makropoulos while he was in New York for the World Championship. For a world sporting organization, this lack of a formal response was troubling. When this indecorous behavior is coupled with the conduct of a World Championship on U.S. soil without so much as a word in advance to the nominal “host” Federation, FIDE’s conduct becomes insulting. Chess deserves better. 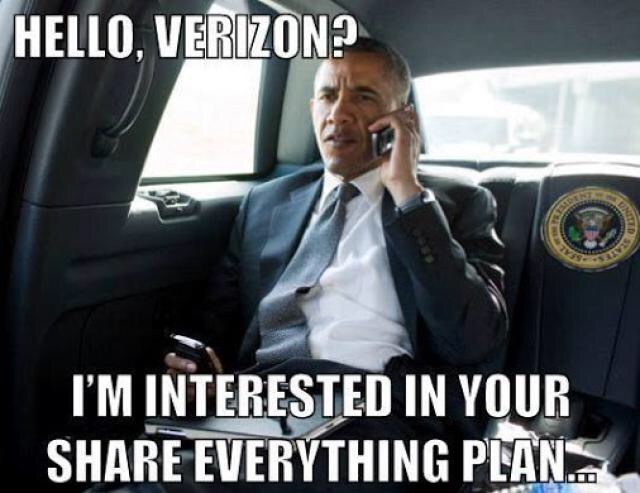 So does US Chess. We are also concerned about the ongoing role of the current FIDE president. FIDE’s communications regarding its President have created a confused state of affairs. FIDE issued a public statement more than a year ago, shortly after the time Mr. Ilyumzhinov was sanctioned by the U.S. Government, in which FIDE declared that Mr. Ilyumzhinov would have no further business, legal, or financial involvement with FIDE’s affairs. The ostensible purpose of his withdrawal from those affairs was so that he could “concentrate on clearing the situation with the US Department of the Treasury.” (See FIDE’s Statement of 12/16/15.) It is beyond time for FIDE to update the world of chess on that “situation.” The world’s greatest game suffers immeasurably under Mr. Ilyumzhinov’s persistent cloud. His own statements do nothing to benefit chess, but rather exacerbate the confusion, including an absurd demand that he be granted U.S citizenship. Moreover, despite that the December 2015 FIDE statement set forth that Mr. Makropoulos would exercise the powers of the president, we note that Mr. Ilyumzhinov has recently attended more than one international event appearing in ceremonies as the President of FIDE. If there has been a change in FIDE’s December 2015 statement, please announce the revisions. Finally, we have received an open letter from the President of the Confederation for Chess of Americas (“CCA”), President Jorge Vega, in which he states that he finds FIDE’s financial situation “worrying.” As President Vega points out in his December 2016 letter, on several occasions AGON has failed to live up to its end of agreements with FIDE, with a predictable injurious effect on FIDE. The failure of AGON to make contractual payments has caused difficulties for some federations that would normally receive support from FIDE. President Vega states that he has informed FIDE in strong terms that it should cancel the agreement with AGON in light of its nonperformance. We echo President Vega’s concerns and recommendations.